Netflix nights are awfully boring with popcorn. You think so too? We recommend picking gourmet flavoured popcorn from Palomitas Popcorn Store. 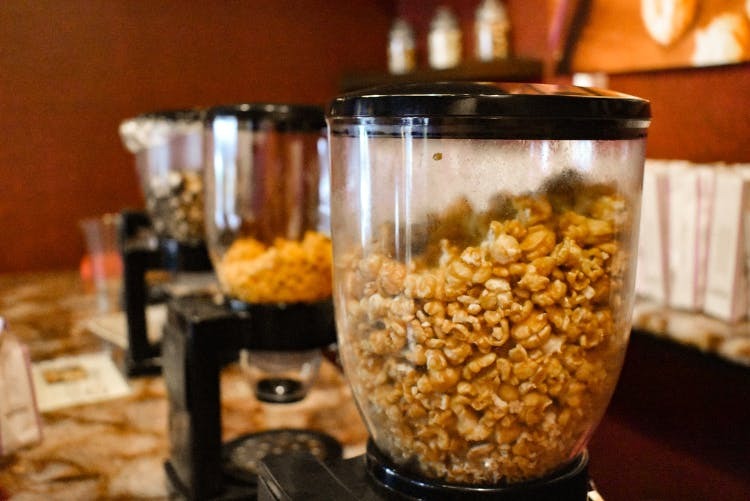 Palomitas Popcorn Store is a dainty store located in Madhapur. With an Instagram-able red door leading you to the counter, find five kinds of popcorn flavours. The sweet-toothed ones can go for Caramel Crunches, Cocoa Caramel Crunches, and the Coffee Caramel Crunches. If you love spicy flavours, go for Asian Spicy Cheese and Smokey Cheese Cravings. Each of them has crunchy kernels air popped and baked to perfection, making them irresistible. You can sample them before you place your order either for a small, medium or a big sized popcorn bag. We loved the Asian Spicy Cheese and The Coffee Caramel Crunches the most and got ourselves a Palomita's Mix (Consisting of two contrasting flavours) bag. Apart from the taste, the packaging really stands out. Purple and white striped bags, in gourmet fashion for you to gift at parties or for movie nights with bae. They offer many more flavours if you place bulk orders. Coffee Walnut Crunches, Butter Blast, Cookies and Cream, Sour Cream and Onion Cheese are only a few to name, but we're drooling already! The popcorn is priced at INR 89 upwards and is quite pocket-friendly. The popcorn is hand made in small batches daily to ensure no preservatives are used, but that means really limited access.